Marching Home: Union Veterans and Their Unending Civil War, Brian Matthew Jordan, Liveright/W.W. Norton Publishing, 2014, 374 pages, bibliographic notes, bibliography, illustrations, paperback $18.95. 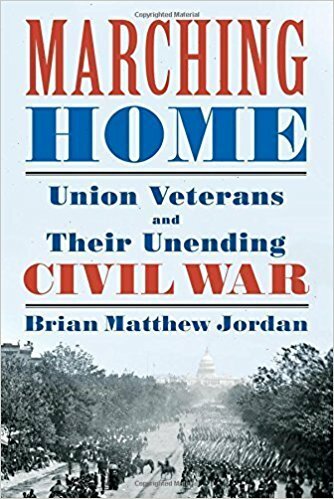 While you read Brian Jordan's Marching Home you may be reminded of Bruce Catton's writing style in his Army of the Potomac trilogy. Clear, concise and frequently offering the stories and words of the soldiers, Jordan's work invokes an immediate awareness to the the pain, patience and passions of the Federal army's veterans. Over 2 million men served and over 360,000 died during those four years. It is likely that another 360,000 died of war wounds during the four decades after the war. Marching Home is the survivors' story. The evidence that Jordan reveals through regimental histories, pension applications, diaries, letters and Grand Army of the Republic business correspondence is that there was much anger and alienation among the veterans. The author finds legions missing arms and legs with most suffering from throbbing stumps which drain blood and pus. Former prisoners of war were housed in asylums and poor houses committing suicide. Society was unprepared to satisfactorily deal with the issues of health, welfare and employment of the veterans. If soldiers on campaign at times looked after their own health and relied on their comrades, then veterans in the post-war era did the same. Jordan discusses the founding and growth of the Grand Army of the Republic, its pension lobbying and the succor of its monthly meetings and annual reunions. He understands the the veterans suffered and unending war with their physical and psychological traumas. In addition veterans dealt with a society and its culture which wished to push the war aside in an effort to reconcile itself to the horror of it all. Jordan grasps that the veterans believed that civilians had not suffered as they had suffered. As in today's political arena, it was a struggle to create a cultural narrative: one that was palatable for civilians but which neglected the suffering of the veterans. Jordan notes the change of in course for the U.S. Sanitary Commission and the U.S. Christian Commission after the war's end. Their ambivalence, like the veterans' kin and communities, revealed a preference for the reconciliation narrative and their lack of an acknowledgment of war's damage to those who served. Marching Home may evoke grief in readers as they come to grips with the tragedy endured by the veterans and the culture's callousness toward physical and emotion needs of those who served and survived.